In an increasingly globalised world manifested in greater economic integration, human capital is an important factor. One of the key sources of human capital to the global economy is India, and the main destinations for Indian professionals has been Western developed economies, the Middle East and Gulf regions and East and Southeast Asia. Southeast Asia as a region has close historical, social and cultural linkages with India, and India has undertaken a number of initiatives under its "Look East" policy (LEP) to enhance ties with the Southeast Asian region. This book examines the trends and motivations of human capital flows from India into this region. Focusing in particular on Malaysia, Singapore, Indonesia and Thailand, the book provides an analysis of Indian labour in a variety of sectors, including information technology (IT) sector, academia, banking, oil and gas. 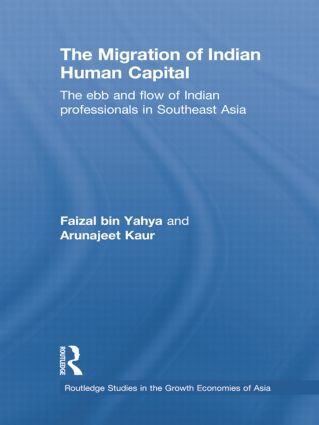 Based on empirical data, the book provides an analysis of current trends in the flow of human capital from India to Southeast Asia. It will be of interest to policy makers, businessmen, students, analysts and academics in the field of Asian studies, foreign relations, human capital and labour migration. Faizal Bin Yahya is a Research Fellow with the Institute of Policy Studies, a research centre at the Lee Kuan Yew School of Public Policy, National University of Singapore. His current research focuses on human capital, ethnic minorities, multiculturalism, and regional linkages in the Asian region. He is the author of Economic Cooperation Between Singapore and India (Routledge 2008). Arunajeet Kaur is a PhD student at the Australian National University, and a Research Associate at the Institute of Southeast Asian Studies, Singapore. Her research is on the Indian diaspora in Southeast Asia including Sikh identity, flow of professional Indian immigrants, and political marginalisation of the Indian minority communities.